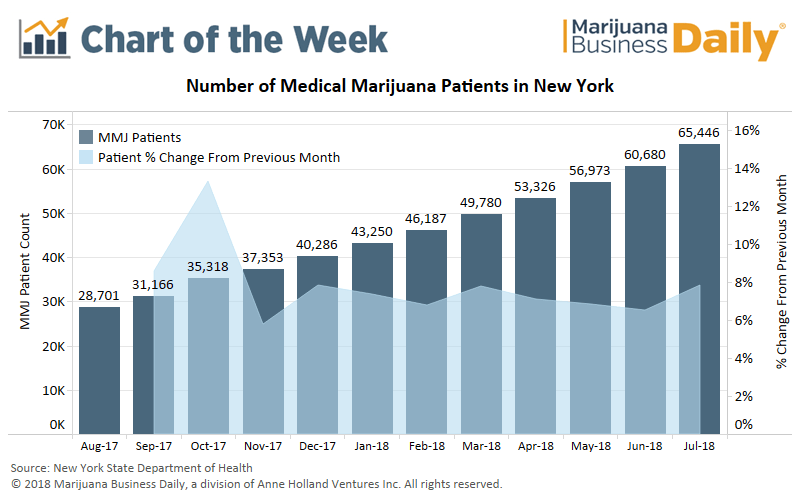 New York’s medical marijuana program is adding patients at a speedy clip, and the recent approval of MMJ as an alternative to opioids has the potential to give sales in the state a substantial boost. Over the past 12 months, nearly 37,000 patients were added to New York’s MMJ program, a 128% increase. The gains were driven largely by the addition in March 2017 of chronic pain as a qualifying MMJ condition, which is typically the most oft-cited condition treated by MMJ patients in states where it’s allowed. But allowing MMJ as an alternative to opioids could prove to be even more significant. According to the Centers for Disease Control and Prevention (CDC), about 19% of the U.S. population had at least one opioid prescription filled in 2016. At that rate, roughly 3.8 million New York residents would qualify to use MMJ as an alternative, based on the state’s population of 19.8 million. If just 4% of qualified patients chose MMJ as an alternative to opioids, it would add approximately 150,000 patients to the program, more than twice the amount currently enrolled. The high price of medical marijuana in the state. Etain, one of six registered MMJ companies currently operating in the state, said on its website that patients typically spend $150-$400 a month on MMJ, depending on the volume. Medical marijuana is not covered by U.S. health insurance providers. Dr. Ajay Wasan, professor and vice chair for pain medicine at the University of Pittsburgh Medical Center, told NPR that opioids may require only a $5 copay for an entire month’s supply. Smokable flower – the most widely used form of marijuana – is prohibited in New York. Traditional edibles, one of the fastest-growing segments of the cannabis industry, also are not allowed. Patients have limited access to New York’s MMJ dispensaries. Currently, 22 dispensaries are open throughout New York, less than one per million state residents. By comparison, there are nearly 90 MMJ dispensaries in Colorado per million residents. Prohibitive, expensive, and juvenile. That is how I would describe this program. So utterly disappointed in my choices as a MMJ patient in NY. I would rather go to Mass and use my card there if they would let me. This is why you see states now taking out of state cards. And, people are moving to those states that offer choice along with decent prices. Get it done NY, the people are speaking directly to you. This program is asinine. $100 for a .4 gram vape? On the “street” $60 for a gram is expensive with strain, ratio, and % included. NYS rates its vapes in 20:1 THC:CBD ratio. This tells you nothing, no percentage of ingredients which include propylene glycol and glycerin along with the two active ingredients. Therefore you can’t even calculate a THC %. NYS prides itself for having the most quantitative and thorough Medical Marijuana Programs yet they provide little to no information on their products’ orgin(strain) and ingredients. NYS claimed that Medical Marijuana had to be purified and quantified like other pharmaceuticals but last time i checked my Lyrica med sheet it tells you everything down to what the capsule is made of. Aside from this there was another inconsistency, the amount of medication in the vape. As i was buying them i noticed the third time there was noticeably less oil in the vape so i weighed it before using it and then again once it was finished and found that rather than the .4 grams as advertised there was only .3 grams (Columbia Care has been notified). 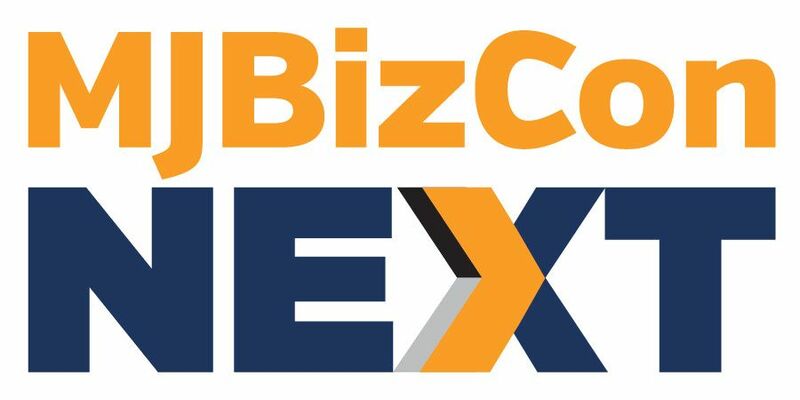 All in all the companies working this program within NY are practicing in a vacuum with no competition, a breeding ground for price gouging and poor quality control as has been proven since the time of Teddy Roosevelt attacking the monopolies in the beginning of the last century. NYS has created regional Monopolies by limiting the number of dispensaries, resulting in collective bargaining set fourth though the state. This is up for debate but the state doesn’t care about the people. I have also notified Columbia Care, and will be sending a letter to the NYS Health Board letting them know just how I feel. And, they kind of need to listen at this point because I know I will be one of many sending the same letter along. It is downright highway robbery with low quality junk I cannot even locate any information on. This is why CC is listed as a pharmaceutical company on LinkedIn, because Nick Vita thinks he has some magical edge and this is how medicinal marijuana in his eyes is supposed to be. No sir, you are completely wrong. And, for the record, they own Patriot Care who operates out of Massachusetts, and they are 1,000,000 times better than their parent company will ever be.